The following is a question from a YTC newsletter reader regarding what appears to be some contradiction between recent articles. Contrast the article in this weeks newsletter (4/10/13), where you say you should focus on and make decisions in the trading timeframe, to the article in last weeks newsletter (27/9/13), where you discuss bypassing the trading timeframe for the lower timeframe to get a feel for the strength or weakness of price movement. I'm sure both are valid concepts, and as an educator you probably have to provide broad education, but I do find it personally confusing. ie – what is lance really saying to me???? Anyway, just putting this forward for some feedback. I do think you do a great job of educating in the broad sense, and I understand it's complex, but I would like to see the content / strategy you put forward be a bit more consistent. Higher Timeframe – Defines the S/R structure within which the trading timeframe moves. Trading Timeframe	– This is used to define the trend, market bias and to identify setup locations. Lower Timeframe – This is used to fine-tune my trading timeframe analysis and to time entry and exit decisions. I trade the middle of these three – the Trading Timeframe. One danger that I see in reader emails, when traders attempt to manage multiple timeframes in this same way, is allowing their focus to be caught up in the detail of the lower timeframe. I get it. The lower timeframe is where all the action is happening. It's fast. It's exciting. If the market is flowing smoothly, it may work out great to take all the lower timeframe triggers. But more often than not, focusing too much on the lower timeframe is simply a recipe for overtrading. You'll catch the good trades. But you'll also take quite a few mediocre trades that just weren't in good setup locations on the trading timeframe chart. If you find this occurring, try minimising your lower timeframe chart. Keep it hidden to ensure focus on the trading timeframe. 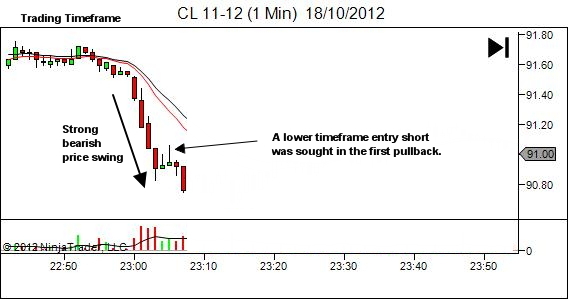 Open the lower timeframe chart when required to fine-tune your analysis. And again when price has moved into a trading timeframe setup area. At all other times, keep it hidden. I'm a big fan of using a lower timeframe to trigger into setups identified on a higher trading timeframe. Typically that lower timeframe trigger will be based upon some kind of candlestick or micro-chart-pattern. The following was an email request I received from a trader who is developing his skills at the same concept. Would you be so kind as to look at the attached charts and tell me if I'm more or less on the right track with going down to the lower timeframe chart to find the trigger? On the LHS is the trading timeframe chart of the SPY symbol, and on the RHS is the lower timeframe chart. The following are the charts, with my comments added following each image. I've removed any reference to the actual timeframes used by this trader, as the concept applies to all trading timeframes with a lower timeframe chosen approximately 3-5 times smaller in scale. Excellent. I'd call it a 123 Bottom rather than Double Bottom, but the result is exactly the same. Nice work! In previous articles I mentioned that my analysis involves monitoring price action, in order to gain an insight into the short term sentiment of the market. Determining who is in control at that time – the bulls or the bears. And assessing how they’re likely to respond to changes in the market. I thought today I’d prepare a quick article to give an overview of how I analyze price. Those of you who know me know that I’m a great fan of candlestick charting. However, price analysis is much more than just watching for your favorite candlestick patterns. Too many people just teach the candlestick patterns, which are fine, but in my opinion there’s some essential analysis missing that an astute trade needs to consider BEFORE they look at price action and respond to every candlestick or bar chart pattern. Let’s have a look at what I mean. Price analysis for me is essentially a top down approach, working from the macro level of Market Structure (so we analyze the big picture first), then down to the current Trend within that structure, and only then do we look at the current price pattern, whether through candlestick analysis or whatever other method works for you. So I basically start off with a wide view of the market, and drill down to the detail in the current price bar or pattern. I prefer to do this over two timeframes. The market structure is defined primarily on a higher timeframe. For me, as a daytrader, that’s the one hour charts. Of course, if you trade differently to me then that can be any other time period you wish. Just make it higher than the timeframe you trade on – I recommend by at least a factor of four. Then on the shorter timeframe (what I call the trading timeframe) I refine the market structure a little further, analyze the movement and strength of the trend, and then assess the bullish or bearish sentiment based on the current price patterns. For me, the trading timeframe’s anywhere from 1 minute to 5 minute charts, depending on the market and its volatility, and how well the price is flowing. So, what do I mean by market structure, trend analysis and price analysis? The higher timeframe chart is opened and any areas of major support or resistance are identified and clearly marked on the chart. Support & Resistance for me are areas of past price congestion, swing highs or lows, or gaps. That doesn’t include any ‘guessing’ at future support or resistance, via the use of pivots points or Fibonacci levels. I’m not a fan of these analysis techniques. Of course, if they work for you, good on you, keep using them. My expectation when I trade is that there is a higher probability of price stalling or reversing at these areas of major support or resistance. Once again, these come from areas of congestion, swing highs or lows, or gaps. That is, areas which are proven to stall price movement or reverse price direction. My expectation with minor support or resistance is for a higher probability of minor support holding in an uptrend, and minor resistance holding in a downtrend. That’s it for Market Structure – simply identifying a support and resistance framework within which price moves. Simple! Having defined our market structure, or a framework within which price will move, we now focus our attention on the current trend. This occurs, as does all further analysis, on the trading timeframe. I conduct analysis on the trend to identify its strength. Is the trend moving strongly, in which case we can anticipate it being more likely to break through the next support or resistance levels, or is it weakening, in which case we have a greater probability of the support or resistance levels forming a barrier to further price movement? We determine the strength of the trend by looking at its proximity to the support and resistance barriers within the framework, and also gain clues from changes in momentum or volatility. Is the current price swing, faster or slower than preceding swings within that trend? Is the current price swing speeding up, or slowing down? Is the volatility changing? Is the average range of the price bars increasing or decreasing? These sorts of questions regarding changes of volatility and momentum can give you clues into the changing strength of the trend, and the likelihood of a reversal at, or continuation through, an area of support or resistance. If you want to get experienced at this, it takes time. Review price charts over and over, identifying how changes of momentum and volatility precede either a continuation or reversal of that trend. Having gained an appreciation of the strength of the trend, and its location within the support and resistance framework, ONLY THEN, finally, do I concern myself with the current price action to determine the bullish or bearish sentiment (or more particularly a potential change of sentiment) through candlestick analysis. What does this little bit of extra work give me? Instead of entering short on a shooting star reversal pattern, just because it matches the shooting star diagram in my book on candlestick patterns, I’m entering short because price just meandered slowly up to a major resistance level. The current price swing has clearly less momentum than both the previous upswing and downswing. And the price bar range is clearly narrowing. This gives a reduced likelihood of the commitment required from the bulls to break through the area of increased supply. The shooting star pattern provides evidence of a clear rejection of prices at that resistance level. This provides me with a lower risk or higher probability trade in the short direction. Instead of entering long on a harami cross reversal pattern, just because it matches the harami cross in my book on candlestick patterns, I’m entering long because a strong and accelerating move downward, on greatly increased volume, extended price rapidly to great distances below its average, right into an area of major support. This is an area where I expect increased demand is likely to be sufficient to absorb and overcome the force of the bears who have spent all their energy on the climactic move downwards. This is an area where I expect price to find support. The harami cross shows a clear halting of the rapid move down, and allows me an opportunity to enter a low risk trade close to an area of major price support. Seriously, the end result might be the same, but at least I’ve entered based on a reasonable assessment of the price action in order to maximize the potential for a lower risk or higher probability trade. Over a lifetime of trading I expect this approach will produce more favorable results than just entering because the pattern matched one I’d memorized from a book. Ok, a bit of a summary, and I know this is a bit of repetition for those familiar with my work, but don’t just blindly take your entry triggers. Think about where they occur within the bigger picture structure of the market. The market structure defines where you trade. The trigger, whether a candlestick pattern or some other form of entry trigger, tells you when to get in, ONLY when you’ve first met the requirements of the market structure rule. 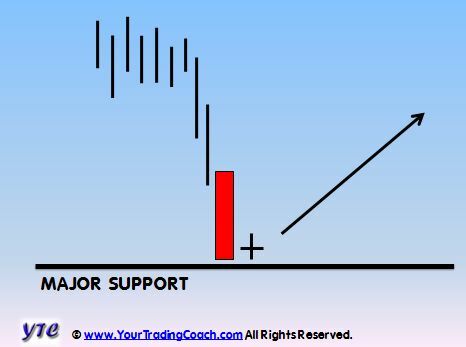 Think about where the current price movement is within a framework of support and resistance. 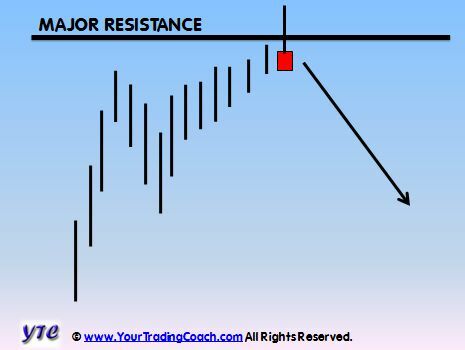 Think about the changing strength of the current trend, or price swing, as it approaches this area of support or resistance. Watch for signs of strength or weakness in the trend, through the clues evident in changes of momentum and volatility. And don’t forget – ALWAYS USE STOPS, because there are no guarantees. This is a game of probabilities.